See the sea lions—sleeping and splashing. Plan a visit and buy ticket online—no service charge. Don't you just love going through old pictures? We stumbled on this one of Zoe and Sierra having a powerfully cuddly nap and we got a laugh. These two had a whole dry deck in this behind-the-scenes area but they opted for the perch and pig-pile approach on the side ledge. 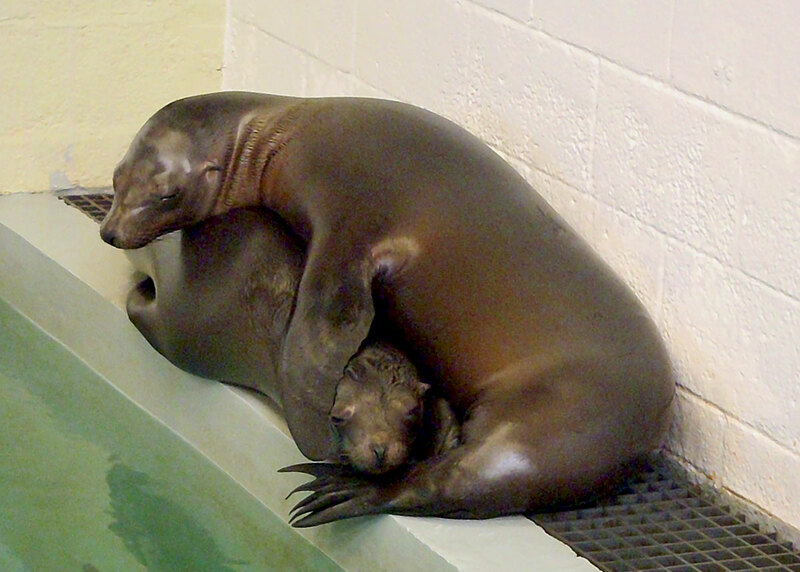 These two sea lions are definitely a tactile pair, almost always touching during nap time, rarely a flipper's distance apart when playing. The fur seals, on the other hand, are much more independent. They may be near each other but they definitely maintain their personal space—even while napping underwater.